Posted By:Unknown | At:3:13 PM Be the first to comment! 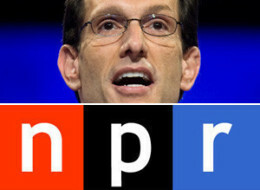 Unwilling to let go of the white-hot sociopolitical debate, House Minority Whip Eric Cantor (R-Va.) announced on Friday tha de-funding National Public Radio would be an option that GOP leadership would consider. Speaking a day after NPR fired longtime analyst Juan Williams for comments he made admitting to a personal fear of Muslims on airplanes, the Virginia Republican joined the chorus of conservatives who have called on Congress to cut the station's funding. House Republicans, Cantor said, would list that option among other policy suggestions that visitors could vote on leadership's YouCut website. "Whether it's people walking off The View when Bill O'Reilly makes a statement about radical Islam or Juan Williams being fired for expressing his opinion, over-reaching political correctness is chipping away at the fundamental American freedoms of speech and expression. NPR's decision to fire Juan Williams not only undermines that, it shows an ignorance of the fact that radical Islam and the terrorists who murder in its name scare people of all faiths, religions, and beliefs. In light of their rash decision, we will include termination of federal funding for NPR as an option in the YouCut program so that Americans can let it be known whether they want their dollars going to that organization." A statement like this is obvious red meat. One only need to watch Fox News these past 24 hours to get the sense of how riled up conservatives are is over William's firing -- using it, in a way, as an opportunistic medium to attack NPR's alleged liberalism. But putting the defunding option on the YouCut website doesn't necessarily guarantee it will happen. When the House GOP leadership unveiled its agenda for the 111th Congress, title America Speaking out, an analysis done by the office of DCCC Chair Chris Van Hollen (D-Md) showed that roughly 80 percent of the ideas put on that website went ignored.